Saunas are a great place to relax and unwind, but did you know one of the hottest benefits of sauna bathing is that it speeds up your body’s natural detox process? According to Lawrence Wilson, M.D., author of Sauna Therapy for Detoxification and Healing, the heat of a sauna performs a similar function to that of a fever. 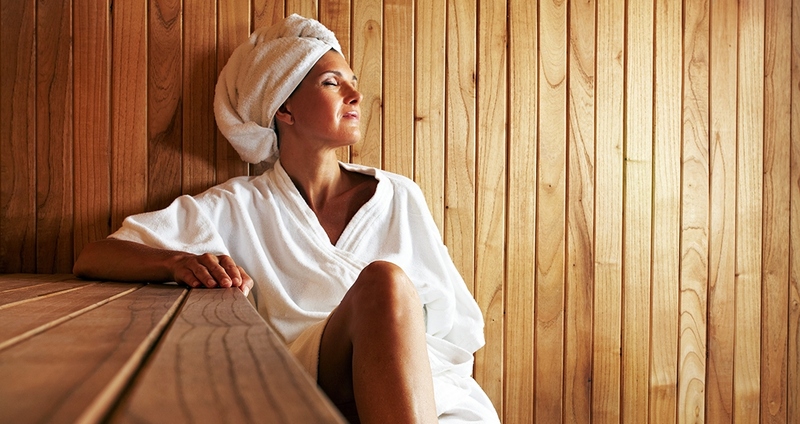 By temporarily raising body temperature, the sauna may help cleanse the body of invasive bacteria, viruses and toxins. A number of scientific studies prove that more toxic chemicals (including phthalates and BPA) are released through sweat than through blood or urine. Not all sweat promotes detoxification, however. While sweating through exercise is great, the blood flow to vital organs is lowered. Wilson says sauna increases heart rate and blood flow to the organs, promoting the excretion of toxins from those organs and out through the skin via sweat. Saunas have been used for centuries all over the world, and in some countries, like Finland, almost every home has one. Besides detoxification, long-term sauna use has been associated with some pretty great health benefits, including stress relief, lower risk of heart attack, dementia and Alzheimer’s, and increased longevity. When most of us think sauna, we picture a wooden box with hot rocks heated by electricity or wood-burning heat. This traditional sauna tests most people’s heat endurance with temperatures up to 200 degrees F. These saunas can also be wet, by introducing steam through generators or by pouring water onto the hot rocks. Steam rooms offer similar benefits to saunas, but the temperatures are lower (110–114 degrees F), and the humidity produced by generators is 100 percent, requiring the rooms to be made of tile and other rustproof material. Most experts recommend building up your heat tolerance at first by staying just a few minutes and then cooling off with a shower before going back in again, not exceeding 10 minutes. Infrared saunas are a good option for those with an intolerance to high heat. The infrared heater produces radiant energy, which is the same as the heat from the sun, only without the harmful ultraviolet rays. This type of sauna heats the body from the inside out instead of heating the air, so the room temperatures are lower and sessions can last longer, up to 45 minutes. Whichever sauna you land in, don’t forget your post-sauna electrolytes. Sweating results in vital mineral loss, so it’s important to replenish. Just ¼ teaspoon of Natural Calm Magnesium along with ½ teaspoon of maple syrup in 16 ounces of water will do the trick.